Proudly sponsored by Protect, the 85km road ride is not for the feint hearted. This is when we start getting serious! One of the most exciting elements to the Ballarat Cycle Classic is that all road courses involve riding the WORLD RENOWNED Australian National Road Cycling Course. How’s that for bragging rights? 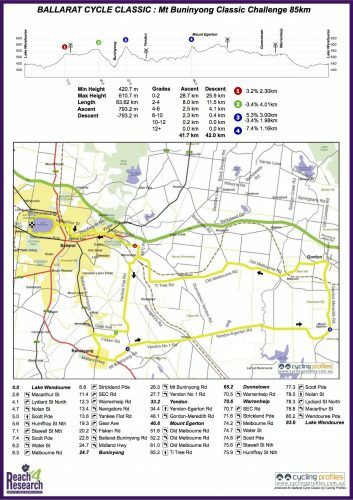 The course involves quiet undulating country roads with the 85km event adding the challenge of Mt Egerton hill to the classic Mt Buninyong highway climb. The course for the 85km goes through Gordon where you will ride past rolling fields, irrigated potato crops and grazing sheep and cattle. All ride options come together in Dunnstown before re-entering Ballarat for the return route up Macarthur Street followed by a clockwise ride around the lake Wendouree to the Cycle Classic village in Windmill Drive. The 85km course includes the WORLD RENOWNED Road National Course. All courses are renowned as safe, quiet, along picturesque country roads. The 85km Classic takes you into arguably some of the best riding country anywhere in Australia. All courses are fully supported with safety marshals, water and food stations and a roving mechanic. The Ballarat Cycle Classic in every respect is a cycling challenge and a memory that will last! Registration Jersey and event bibs need to be picked up prior to the race. You can do this on Saturday 16th onsite between 2-6pm, alternatively from 7.00am on the day.